President Donald Trump waves as he walks from the stage at Elko Regional Airport, Oct. 20, 2018, in Elko, Nev., after speaking during a campaign rally. President Donald Trump said Saturday that he would pull the United States from the Intermediate-Range Nuclear Forces Treaty because Russia had violated the agreement, but he provided no details of the violations. “We'll have to develop those weapons, unless Russia comes to us and China comes to us and they all come to us and say let's really get smart and let's none of us develop those weapons, but if Russia's doing it and if China's doing it, and we're adhering to the agreement, that's unacceptable,”' he said. 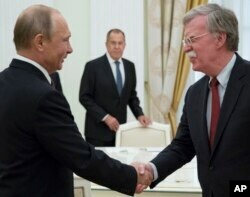 FILE - In this June 27, 2018, photo, Russian President Vladimir Putin, left, and U.S. national security adviser John Bolton greet each other as Russian Foreign Minister Sergey Lavrov looks on during a meeting in the Kremlin in Moscow. "If they get smart and if others get smart and they say let's not develop these horrible nuclear weapons, I would be extremely happy with that, but as long as somebody's violating the agreement, we're not going to be the only ones to adhere to it,'' Trump said.